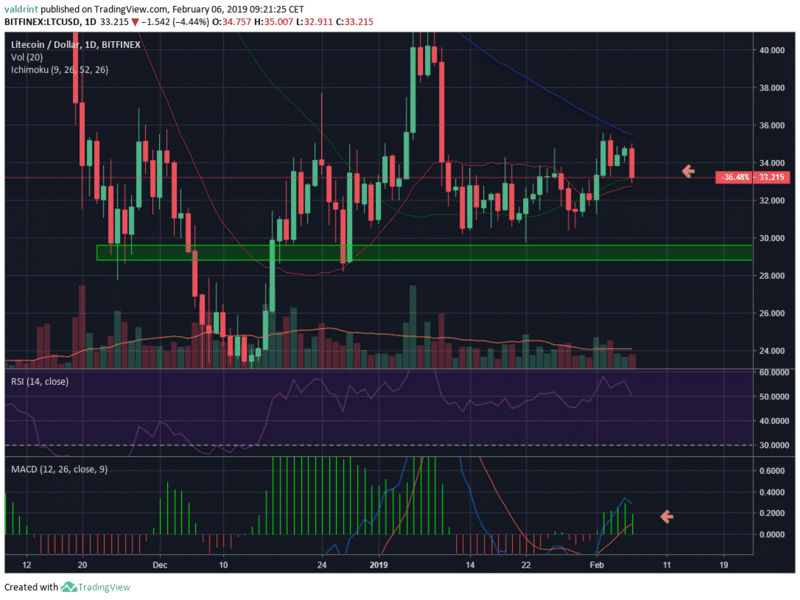 Litecoin [LTC] Price Analysis: Is The Recent Bearish Candle A Sign Of Things To Come? 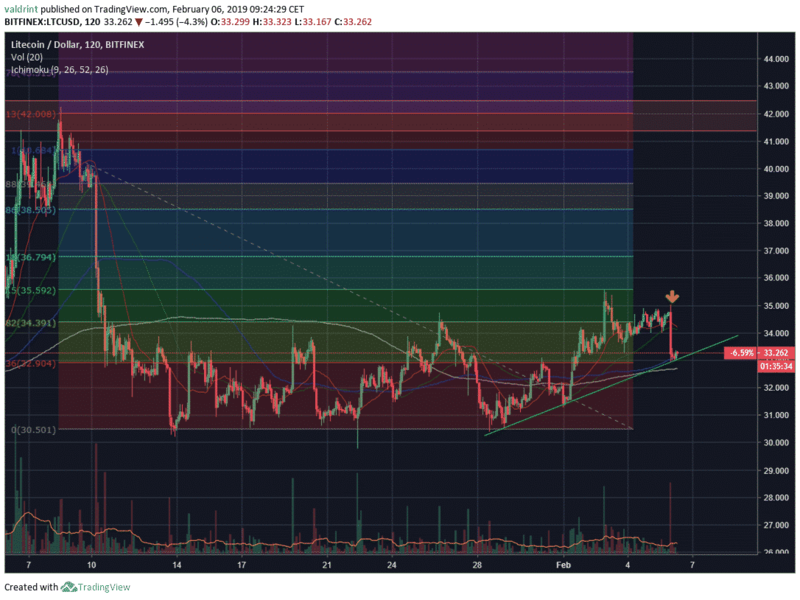 The price of Litecoin failed to retrace past the 0.5 fib line of the drop from $41 to $30. Price just made a bearish engulfing 2-hour candle. A look at the Daily chart shows that price made a second unsuccessful attempt to break through the 50-period MA (blue line) and got rejected. Price retraced and has currently found support at the 7-period MA, which has recently made a bearish cross. It is of importance to keep an eye on the daily closing price since the first 9 hours of the day were extremely bearish. While the LTC/USD price opened at $35, it is currently trading at $33.2, a drop of 5%. Furthermore, the MACD is losing its power and setting itself up to make a bearish cross. It is of importance to keep an eye on the MACD since the bearish cross could occur during the next 2-3 days. A closer look at the 2-hour chart shows us that after launching an upward rally on January 28th, price failed to retrace past the 0.5 fib line of the drop from the $42 high to the $30 low. After two unsuccessful attempts to break past the 0.328 fib line at $34.3, the price was successful on the third attempt, but immediately got pushed back once it reached $35.5. Price formed a bearish engulfing 2-hour candle (yellow arrow) on very significant volume and has retraced back all the way to the 200-period MA, forming an ascending support line in the process. A break below the 200-period MA and the support line would put the recent support area at $30.5 into play. Furthermore, the 7 and 21 period MAs are very close to making a bearish cross, placing the price firmly into bearish territory. The closest support area is near $29, with major support near $23. The major resistance area is near the January 8th top at $41. The post Litecoin [LTC] Price Analysis: Is The Recent Bearish Candle A Sign Of Things To Come? appeared first on Coingape.